For many observers, the world economic situation is weak to the extent of leading us to a point of no return. We’re heading toward a global financial crisis. The United States is sinking in public debt, the way an elephant sinks in quicksand. Meanwhile, China, one of the biggest holders of U.S. Treasuries, is showing signs of weakness. The Chinese economy appears to be heading for a recession, if not a downright crash. The Chinese market is teetering on the brink of another summer-of-2015-style crash. Analysts managed to explain that problem away, suggesting that Chinese investors were inexperienced and pulled out of stocks they knew nothing about—without any sense of strategy or logic. Then the Chinese government pumped money into the system in order to mitigate the effects of the crash. The makings of another crisis are in China now. The big question is whether the same mixture of platitudes (passing as reassurances) and Chinese government bailouts can avert the crisis. The Chinese markets are all but begging for a major crash to happen. That may happen soon, even within the coming months. Investors are increasingly fearful of an imminent crash of the Chinese market. The first symptom of the inevitable global economic financial crisis should be familiar to Americans. Like the financial crashes of 1929 and 2008 in the U.S., unsustainable debt levels could burst the credit bubble. This has inflated to dangerous levels. To fully grasp the impact of the downgrade, consider that, in 1989, China was struggling with one of the biggest political crises since the foundation of the People’s Republic of China in October 1949. The symbol of that crisis became a young man resisting a tank in Tiananmen Square. Thus, the shift in Moody’s opinion on China’s outlook, to merely “stable,” even if it is an upgrade, might be temporary. There is a high likelihood that the very same Moody’s will downgrade China even further before 2017 is over. China, like so many booming economies before it, cannot grow perpetually. The risk is that the Moody’s downgrade, intended most likely to slow down the Chinese credit crisis could expose the real weaknesses. That’s when the Chinese market bubble could burst. 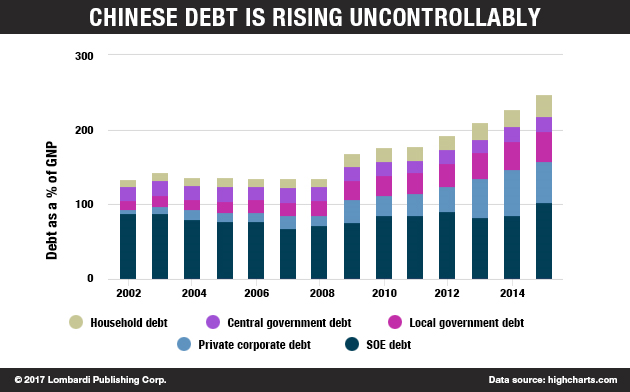 China’s sovereign debt is largely held by domestic investors, which could be an assurance. Except, the rating downgrade has started to raise the doubts of investors all over the world. As it is for any economic power, financial security is a key and strategic issue for China. Yet China’s central bank, the People’s Bank of China (PBOC), has alerted the markets that Chinese debt is reaching dangerous levels. Financial leveraging has reached an alarming pace. One wonders even if the bank has enough liquidity. The result of the facts leaking out have increased China’s risk of default. The Chinese stock markets, therefore, were already ripe for the bears. The PBOC has responded by lowering the value of the yuan. Moreover, the Moody’s downgrade will likely spread throughout the region. This will be seen as a liability in the Chinese markets. The same inexperience that was shown by Chinese investors in 2015 and early 2016 will react to these liabilities in the same way that a dam reacts to excessive pressure from flooding waters. It will burst. The products that could go bust, triggering a major financial crash in China, are the so-called wealth management products (WMPs), which burst on Wall Street in 2007–2008. Let’s call these “collateralized debt obligations” (CDOs). They could break the Chinese markets too, in the same way they did in the United States. They are unsecured financial products placed on the market by Chinese banks and other financial institutions. Like the subprime-mortgage-based CDOs, these are assets that generally promise high returns. China is reaching a dangerous phase of disillusionment. After an intense period of growth that effectively started in 1979, a sudden coming to terms with a more-pessimistic reality could have tremendous psychological effects. These will add to the financial realities, triggering China’s first true recession or depression. Moreover, there is a suspicion that China’s reality is far worse than what the authorities have allowed to be reported. After all, unlike a U.S. president or a German chancellor, President Xi’s political powers approach those of an emperor. He would be more like the great Kublai Khan than Donald Trump or Angela Merkel. But, in reality, Xi represents a new generation of less-ideological Communists. He has less power than former leader Deng Xiaoping did. Xiaoping was the de facto ruler of China in 1989 when the Tiananmen Square protests reached their apex. Xiaoping had to contend with other Communist Party leaders, taking a much harder political line than he would have wanted. This means that, even if Xi decides to reform the political system, there are no assurances that he will be able to implement it successfully. The final reform that China needs to achieve for the next phase of economic growth can only be political democracy, having already—in practice—adopted capitalism. After all, China may have more millionaires than the United States. Still, Xi’s constraints on power have allowed a wave of uncertainty and skepticism around him that could turn to fear. In turn, that could spark a more intense protest phenomenon than the Tiananmen Square massacre. The current economic slowdown and the possibility, or even probability, of a debt crisis could revive demands for political change. It’s unlikely that the Communist Party would give up its stranglehold on power without a fight. That would certainly affect the Chinese economy. Still, even if political reform demands remain suppressed, there can be little doubt that China, the world’s economic engine, is slowing down. It was years of rapid growth in China that fueled the commodity-based economies of South America, enabling growth in that region. If many parts of Latin America are today experiencing turmoil—in various degrees—from Brazil to Venezuela, it’s partly because of slowing demand from China. A Chinese financial or economic collapse would affect the whole global economy. Even a shift in the nature of China’s economy would alter the global markets, causing changes that could have negative outcomes in the financial markets. China, like it or not, is maturing; its economy is becoming gradually and inevitably more advanced. Just as happened in the mature economies of the West, there is a shift from the industrial sector to services. This has increased the fear that the Chinese economy is slowing down at a faster pace than expected. Meanwhile, the Chinese government’s cryptic reporting creates uncertainty: how bad is the situation? The latest data was clearly enough to prompt Moody’s from expressing less-than-encouraging views. Nobody really understands the risks because they don’t know how serious the situation in China is. The Chinese government is notorious for publishing unreliable and modified data to suit its political purposes. Fraser Howie, author of Red Capitalism—a book that highlighted the limits of China’s debt-based economic model—expresses doubts about China’s GDP growth rate. That rate has been shrinking, according to the World Bank. A crisis in China could reveal the ugly truth and spark a major market collapse. Thus, the risk is that China is slowing down more than investors believe. China could spark a global economic recession from one moment to the next, because so many bad surprises could emerge. A global recession would doubtless reverse the upswing on Wall Street, which has pushed stock valuations to new records in 2017, due to a wave of irrational exuberance.